Read both of Leslie McDevitt's Control Unleashed books a couple of times, read a little bit on learning theory, and read something along the lines of Clothier's "Bones Would Rain From the Sky"
Decide on your training philosophy, goals, etc.. Attend a couple of classes to see how sessions are run. If you see things that you don't agree with, then consider not taking the class. Or once again, ensure that you will not be required to do the things you don't agree with. 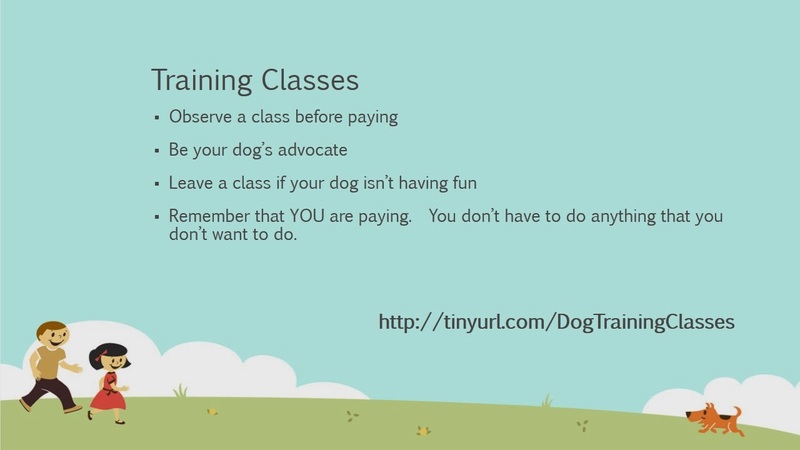 If a trainer is annoyed with or too busy for your questions and/or does not let you observe a couple of classes before paying (or at least partial sessions), then do not sign up for his or her class. 5). If your dog is stressed or reactive and there aren't any ways to make him/her more comfortable. Note: don't let the fact that you spent money on a class be a deciding factor on when to quit. It's better to loose 100 dollars now rather than spend several hundred dollars later to fix behavioral problems that arose as a result of a bad class environment. If your dog isn't comfortable with strange humans, be prepared to body block or use the "stop" hand gesture on humans who insist they are "good with dogs"
2). Arrive early. Play a few games by yourself before others arrive. Right before others arrive, set up your area using partitions or dividers. If the training facility doesn't have any, bring your own. Use something lightweight and portable like this folding pet gate and/or bring a soft crate. Bring a mat as well. A). Set yourself up inside the gates and/or crate, then engage your dog as the other dogs come in - use treats/toys Control Unleashed games, etc.. (practice the engagement during boring times so you will be ready for class). Be ready to body block or toss a toy or treat if a dog or human gets too close to your dog. B). Don't let dogs or humans approach the crate if you use one - your dog might feel trapped. If your dog will have a hard time engaging with you, consider covering the crate as dogs come in. This may or may not work. Some dogs might get more frustrated if hey can hear and smell but not see - so be careful. You might try something that reduces visual stimulation but doesn't eliminate visuals completely. 4). If you are not allowed to come early, then you might need to be a little late. Don't bunch up at the door when everyone is going in at the same time. Wait at a comfortable distance (for your dog) away from everyone until all have filed in, then you can go in. Keep your dog engaged with you as you walk in. Control Unleashed or Pattern Games might be helpful here. 5). When class starts, don't feel like you have to do the same thing the class is doing. If the class is working on something that is difficult or stressful for your dog, then try something else that might be easier for your dog. Set him/her up for success. 6). During down times when the instructor is talking, engage your dog, or put him/her in the crate or on a mat with toys/food, chewies, etc..
7). Be prepared to take a break and go outside or leave early if your dog becomes increasingly uncomfortable. 8). Do not hand your leash to an instructor unless you are positive that he or she won't do anything painful or scary to your dog. Don't hand your leash to an instructor if you dog is uncomfortable. If a trainer is insistent that you do things that make you or your dog uncomfortable, just remind yourself that you are are paying the trainer and not the other way around. It doesn't matter if the trainer is the expert. The only thing that matters is keeping your dog comfortable and safe. And remember that you know your dog better than anyone else. When deciding whether or not to continue training, in addition to observing your dog in class, also observe your companion outside of class. If your pup all of a sudden seems more snappy towards siblings, or more reactive to dogs when on walks, or more afraid of thunder, or starts having potty accidents, etc..consider stress from class could be spilling over into other areas. Quit the class or work on ways to make class less stressful and/or more fun if this happens. If you have a dog who is fearful of people or other dogs, don't make the dog face his/her fears. Stay below threshold. More details in the Control Unleashed books and DVDs. Great (and thorough) advice! Wish I was more on top of this with my dog (border collie/great pyr mix). We attended puppy kindergarten for 6 wks when he was about 4 months old and that class was ok for a beginner class. But when we went to our next level at a different training center (through a reputable pet store) I spoke to the trainer in advance and was happy with his philosophy of training and his handling skills but ended up being very unhappy with how the class was conducted. Our dog was about 7 months by then and he got very frustrated with the lack of freedom in the class (dogs never had playtime together and we were expected to keep them quietly by our side in between all the lengthy explanations and demos). We when had a turn to try something we had to manage the exercise down the aisles of the busy store - way too many distractions - people, dogs, kids, food, toys, etc.... Although I was not happy with the class, we continued to try to make it work. I didn't see how much the frustration was building up and after 3 weeks of class he ended up lunging at a new person (customer in store) who tried to pet him on the head at the end of class. We did not return to class and instead started working with a private trainer at home. I should have done much more homework first and also left the class when I saw how poorly it was structured. Lesson learned but a bit late! !